Claiming that President Trump “chastised” America’s NATO allies for not spending more on defense, the establishment media has emphasized what is perhaps the least important aspect of the President’s recent speech in Brussels. The most important part of his speech was not the part where he played bill collector for America’s hard-pressed taxpayers. President Trump’s point to the leaders of NATO countries, particularly German Chancellor Angela Merkel and French President Emmanuel Macron, was that their immigration policies facilitated jihad through terrorism. The President’s point making the connection between Muslim immigration and terrorism could not have been lost on Macron, Merkel and British Prime Minister Theresa May, all of whom bear some responsibility for the terrorist attacks in their countries because they have failed to aggressively defend their borders from jihadi invaders posing as refugees and immigrants. However, terrorism isn’t the only, or even the most effective, weapon Islamists have deployed to undermine America and American values; the export of Sharia through cultural jihad and the doctrine of hijra – invasion through immigration – have been much more effective rendering many parts of France, Germany, Belgium and the United Kingdom into “no go zones” for the police and especially Western women. 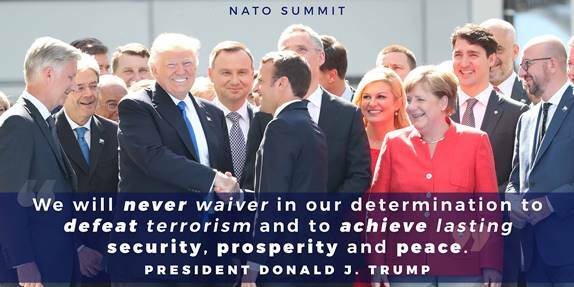 The message “The NATO of the future must include a great focus on terrorism and immigration…” is no different than the message President Trump delivered to the Muslim heads of state, where he pointedly told them they must drive jihadis out of their countries and religious institutions. The leaders of the Middle East have agreed at this unprecedented meeting to stop funding the radical ideology that leads to this horrible terrorism all over the globe. This promise, if it is acted upon by Saudi Arabia, Turkey, Pakistan and other Muslim majority countries that are known to have funded or encouraged jihad, really is an unprecedented development. As we pointed out in our article about President Trump’s meetings and remarks in Saudi Arabia, for too long the Saudis have been allowed to be both arsonist and fireman – spending billions to build mosques and fund preachers who promote Sharia-supremacy and then claiming to be opposed to Islamist terrorism. From the President’s remarks to the NATO heads of state it appears that, in his private meetings in Saudi Arabia he not only made that point, but he also got a commitment for it to stop. Will the Saudis really stop exporting Salafism? We have our doubts, however, President Trump appears to have received an paradigm-shifting commitment from the Saudis and perhaps other Muslim-majority nations to stop exporting jihad, now it is up to the Europeans to do their part by joining Trump in making sure the NATO of the future includes a greater focus on terrorism and immigration.